Dublin has a lot of new restaurants. They are sprouting up everywhere. One such example is The Hot Stove on Parnell Square. It’s in a basement on the square, on the Rotunda entrance side. Off the bat, the room didn’t appeal to me. It was nearly painfully bright. Personally I do better in soft lighting. The white walls, coupled with bright lights, meant that if you were there with the in-laws it could feel like an authentic interrogation chamber. On the plus side- the photos of the food turned out really well. Nicely lit. We were greeted warmly and our soggy outer garments were taken, it was biblically wet that day. Other waiters circled, and gave some solicited and unsolicited advice re: the menu. The wine recommended was towards the pricier end of the spectrum, and coupled with one of the more expensive dishes on the menu, would be quite pleasant for my taste-buds I was assured, but perhaps not for my wallet. Additionally when we were asked did we want a side dish and the duck fat fries at €5 were recommended, we skipped them and went for the crushed artichokes. We were then asked *again* did we want fries. Up-sell tastic. Apart from that the service was attentive and friendly throughout. An amuse-bouche of parsnip soup, parsley pesto and chorizo was exactly what we needed to start our defrost from the night outside and was very pleasant. Breads, one home-made and one from the Paris Bakery nearby were lovely and served with in-house churned butter. I started with the seared mackerel. A nice piece of seared mackerel, the rilette was a little unremarkable, but it was with a crunchy and fresh fennel and apple salad. The cube of apple jelly, added nothing to the dish as it lacked any discernible flavour. The confirmed foodie, again my partner in dining went for the oxtail raviolo. The filling was flavoursome and unctuous but I thought the pasta was a little under, but she reckoned it had just been overworked. 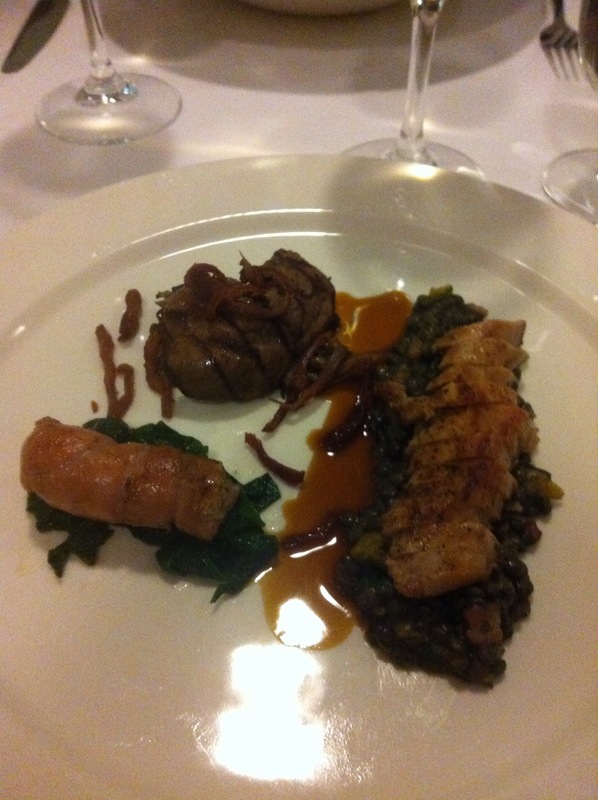 Mains- I went for the rabbit. It was seasoned nicely, but a little over, and the confit cannelloni was quite rubbery. The lentils it came with were very tasty. My companion’s hake was a nice dish, served with black olive gnocchi and salsify. The salsify was delicious, and cooked perfectly, however overall it was agreed the dish lacked seasoning. The side of crushed Jerusalem artichokes was actually the dish of the night. Wonderful texture, and had bags of flavour. For dessert I was served a perfectly cooked chocolate fondant. I didn’t like the orange-blossom sorbet, it reminded me of a Vitamin C cordial I was force-fed as a child. Herself got a rhubarb crumble- which was her favourite dish of the night. The rhubarb had just been cooked enough that it fell apart so retained a very pleasing bit of bite. All in all with a bottle of wine and two double espresso, it came in at €121. There is great potential in The Hot Stove. The menu reads well. They just need to turn down the lights, turn up some of the flavours and cooking- and stop the unnecessary levels of up sell.